Fox Searchlight Pictures and Indian Paintbrush bring together an all-star voice cast (Koyu Rankin, Greta Gerwig, Yoko Ono, Frances McDormand, Live Schreiber, Edward Norton, Bill Murray, Bob Balaban, Jeff Goldblum, Bryan Cranston, Scarlett Johansson, F. Murray Abraham, Tilda Swinton and Harvey Keitel) in Wes Anderson’s endearing breakthrough stop-motion animation “Isle of Dogs” that will exclusively open in Ayala Malls Cinemas on May 30. “Isle of Dogs” is a grand adventure in set in a near-future Japan in the grips of a canine crisis and mass anti-dog hysteria where a boy tries to find and rescue his dog in a place known as Trash Island. The story, with its chatty canines, furred femmes fatales, a boy aviator, an intrepid school reporter, mutant viruses, mythical isle and step-by-step unraveling of a big human mistake, developed over time and innumerable cups of tea. With its semi-fictional Japanese setting, its construction out of comic book-like chapters and its intercut themes of nature, heroism, technology, rescue and honor, perhaps it was only natural that the film would also reverberate with echoes of Japanese pop culture and some of Japan’s greatest film directors, from Yasujiro Ozu to Kurosawa to Seijun Suzuki, as well as the Japanese monster films of the 50s and 60s, with their climactic disasters. “We think of it as referring to a whole range of Japanese filmmakers and Japanese culture, but Kurosawa is the main movie influence,” says Anderson. 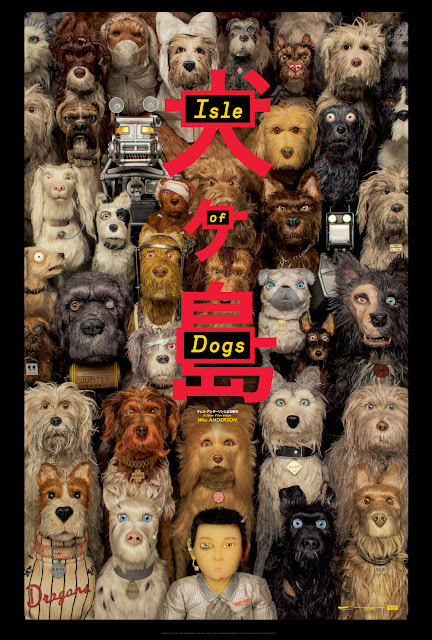 From 20th Century Fox, “Isle of Dogs” opens exclusively at Ayala Malls Cinemas: Glorietta 4, Trinoma, Market!Market!, Cloverleaf Balintawak and Fairview Terraces.